Hearty holiday meals are a well-deserved treat after weeks of shopping and ugly sweater parties. After all, spreading good cheer can really work up an appetite. 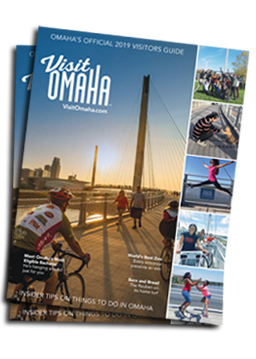 So forget about calorie counting, pack you comfiest stretchy pants, and head to Omaha for a festive weekend filled with feasting. Where does a foodie start in a city built for eating? In Omaha, you follow the smell of sizzling beef. Omaha’s legendary steaks call carnivores to make the pilgrimage for the perfect cut of beef. Flame broiled, whiskey doused, and wood fire-grilled – all delicious, and all perfected in Omaha. Some like beef best on bread. We don’t care what New Yorkers say – the Reuben sandwich was created and bred for success right here in Omaha. Two pieces of grilled marble rye stuffed with slow cooked corned beef topped with sauerkraut, bubbly Swiss cheese, and creamy Russian or Thousand Island dressing. Many Omaha restaurants add a unique spin to the classic. Beef comes in many different shapes and sizes, and some sizes are downright intimidating. The Stellanator, weighing in at 4.5 lbs. and 4,900 calories, includes six burger patties, six fried eggs, six pieces of cheese, 12 pieces of bacon, lettuce, tomato, fried onions, pickles, jalapeños, and peanut butter. Stella’s has only seen 19 successful takedowns (280 have lost). Omaha can make a mean burger, but this one brings on the meat sweats! We’ll end on a sweet note. Omaha’s sweet shops will satisfy any sweet tooth, with everything from made-from-scratch ice cream and gooey cordial cherries, to towering Napoleon torte and cheesecake by the foot, to homemade fudge and mudball truffles. It’s the holiday season, and you deserve a treat (or two, or three). Click here to watch the Now Serving Omaha videos to get a taste of Omaha flavor. Click on the boxes below to check out Omaha restaurants and specialties.